The Never Summer Summit is about as off the tail surfy as it gets. 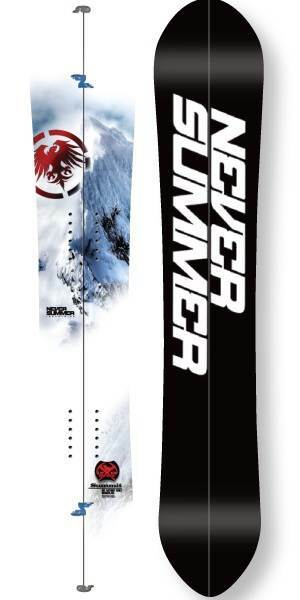 It has a huge nose, almost 2 cm of taper and a narrow waist so it is like surfing in snow. The Summit’s set back is massive and it’s very very slashy surfy. This ride is not for everyone but those that want the most surfy powder ride possible but also want a little size might really appreciate the Summit. Conditions: Powder from 1 foot to 4 feet. We had some icy spots at the top and a little time on soft snow groomers. Set Up- 23 inches wide set back 18 front 0 back for Peter and James. Eli was 22 inches wide set back 18 front and 0 back goofy. 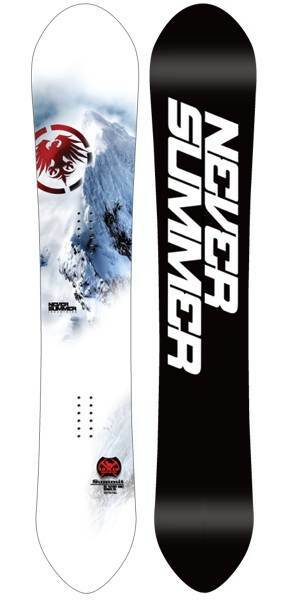 Overall the Never Summer Summit snowboard performs very well when it’s very deep. For us it was missing something that made us completely stoked on the board. We felt the set back is soo far back on a tapered tail and every rider who tried it felt awkward and it rode a little squirly compared to the Never Summer Raptor and Never Summer Premier. There are many powder boards that do really well on groomers but this is just a powder board that floats over any depth with out any issues. The 2013, 2012 and 2011 are almost identical in terms of riding style. Powder: We have tried this in 2-5 foot plus thick sierra powder. We have been riding this since the camber days and even back then it had minimal rear leg burn. The Hybrid rocker board almost completely eliminates rear leg burn. Like any big board the one disadvantage is when you get in to a tracked/rutted out area in the trees where you have to make quick stops and tight turns it doesn’t perform as well as the small boards but it’s very easy to make quick turns for it’s size. It busts up chunder and tracked up snow pretty well. Even though when it’s all tracked out and sun baked the summit still had enough weight, shock absorption and dampness to make it better than it should be. Never summer doesn’t spec out the set back but it’s really far back. From our measurements it looks like it’s around 5 inches and you are basically riding on the tail just like the Burton Fish. There is only 16 inches between the tail and the last insert. What is cool about this model is you can get a pin tail in a 167 and 172 so you can float through anything and also keep speed in flatter terrain. Some people might not like being this far back on the tail and some might love it. On Snow Feel: This is loose between the feet when it’s harder and a little more stable between the feet when the snow is softer. It’s really really surfy but can be a little squirrely in hard pack with flat basing. The taper in the tail is like 2 inches. It’s not an ideal groomer board. It’s just so off the tail that it feels a little weird on the groomers. Turn Initiation: For a board of it’s size and stiffness it is incredibly easy to turn but it’s not as slashy as a smaller tapered board. I have had a couple moments in softer snow on the way back to where the car is parked and it carved ok in perfect groomed packed powder but it’s definitely not a day in day out groomer/freeride board. Speed: It can take almost any speed you can throw at it and stay damp. Riding so far back on the tail can make it a little squirly compared to a traditional board but eventually you get use to it. 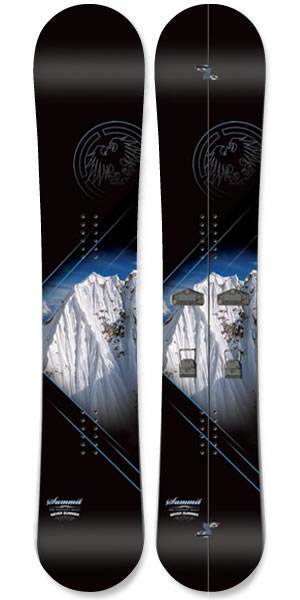 Uneven Terrain: The Summit can handle uneven terrain very well for a board that long. It’s got a lot of shock absorption and handles that crappy bumpy snow you have to pass through to get to the good stuff rather well. Approximate Weight: Never Summer isn’t known for making a feather board but they are known for long term reliability. This board is pretty heavy even for it’s size. We gave it a 3 and don’t really care about the weight. Flex: Stiff as it can get through the mid section but pretty soft on the tip and tail. Like we said above for a board this stiff it really turns well. The rest of the categories don’t matter……..
We try to get as many images of the Never Summer Summit, but forgive us if they're not all there.